Fuel up: Before a Halloween party or trick or treating, serve yourself and your family a monster size portion (in other words: a cup or 2) of fruits and/or vegetables. Include some lean protein and maybe a whole grain to round out a nutritious meal. Variety: Treats need not only come in the candy variety. Consider sweets and treats that have nutritional value such as packs of raisins, whole grain pretzels, or 100% fruit juice. 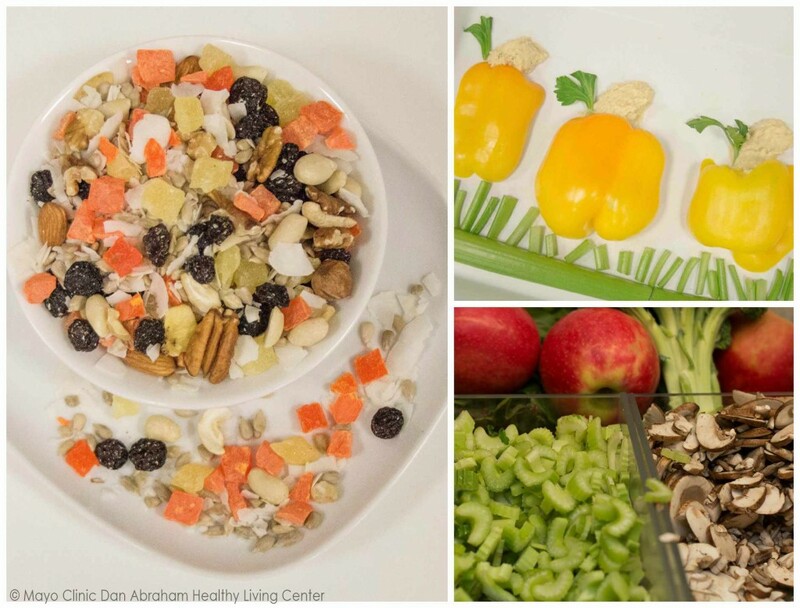 Share: If you want to treat the office, share a fruit based dessert, cut up veggies and arrange in fun shapes. We used 2 yellow peppers (orange pepper would work, too! ), cut in half and made a pumpkin patch. We added hummus as the stem and celery on the bottom as if growing around grass. Simple + fun! Or make a Halloween-colored dried fruit and nut trail mix. Dried apricots, raisins and dried bananas work perfectly. Get in the spirit of this fun holiday – put on a costume and go for walk or dance at our Halloween zumba class! Enjoy some good food and sample a few treats. Have fun! I eat and have fun!